Scientists from the CDF and DZero collaborations at the U.S. Department of Energy's Fermilab have combined Tevatron data from the two experiments to advance the quest for the long-sought Higgs boson. 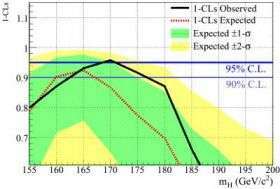 Their results indicate that Fermilab researchers have for the first time excluded, with 95 percent probability, a mass for the Higgs of 170 GeV. This value lies near the middle of the possible mass range for the particle established by earlier experiments. This result not only restricts the possible masses where the Higgs might lie, but it also demonstrates that the Tevatron experiments are sensitive to potential Higgs signals. We are here to report there is nothing here to report. I think I have had a stroke and lost my ability to read. I can understand how they can rule out lower values but how do they exclude the higher energies without being able to test them yet? 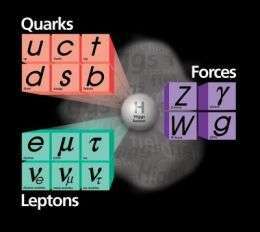 the higgs particle theory cannot even explain the variety of particles each with a different mass. Maybe the Higgs theory is a lot of hot air. What the hell is "It's all 'relative'" supposed to mean in Velanarris' comment? Probably one of those idiots who think Einstein's theory has something to say about ethics. I don't understand it myself, but I understand it, and people, well enough to know most people (including many "scientists") who pretend they have an inkling of understanding about relativity or quantum physics are clueless losers. jburchel- I take Velanarris' comment to mean that the value of such knowledge is relevant to some lines of questioning and not others (such as earls' view of the report). Now I feel obligated to point out that "I don't understand it myself, but I understand it..." could also be hard to interpret, though obviously there is a logical thought behind your words (it just takes reading that sentence a few times). Perhaps we can all just accept that the written word is not a perfect conveyor of thought, and gloss over the occasional misspeak without getting angry? @velanarris: The primary mode of human learning is facilitated by the knowledge of what we know something to be because we know what it is NOT. By determining what not to look for we can understand what we should look for. In any event, if the Higgs Theory is wrong, we will only know by looking in every possible place and coming up with, as NeilFarbstein put it (above this comment), nothing but a lot of "hot air". @mattytheory- seems like velanarris is one of the ones who agree with you. Standard science is using an educated guess to figure out the starting reason for where to look and then bounding this location with a bunch of "is nots"
I find it fun that most people think scientists are boring when in fact they are adventurers.